Mama Mia! Here We Go Again is another fun feel-good nostalgic ride and enjoyable movie going experience. Yes, silly, crazy and all over the place - but poignant at times and so much fun as a nice respite from your own daily life. 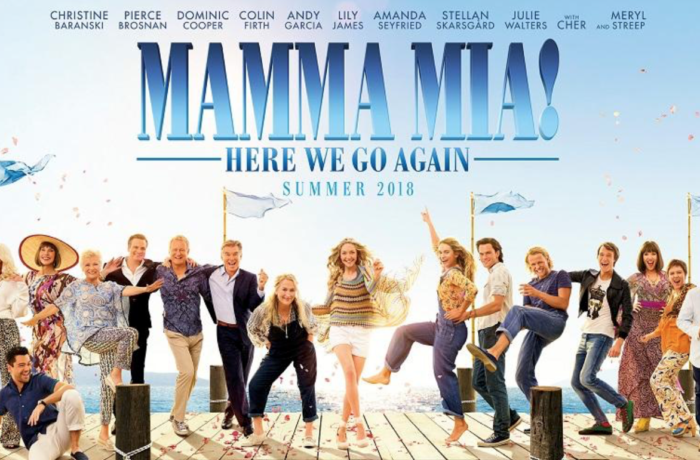 Mamma Mia was one of the biggest hits of 2008 making $610 million dollars at the box office. Even though the movie was not a good piece of fieldwork - it has its cult following and will always be true to anything ABBA. 10 years after the first, we now have another dance and sing-along-romp (with probably too many characters) that leaves you in a gleeful mood knowing why you came in the first place. ABBA’s classics are done well yet again in this musical escape and the choreography is great - making you think of just how much fun this must have been to make. Written and director by Ol Parker, this is a prequel and a sequel. The storyline comes in years after the first one. It's about Donna and her backstory. Meryl Streep’s character Donna has died so her daughter Sophie played by Amanda Seyfried is now running her mothers hotel. The movie flashes back to when Donna had her fling with three men, played then by Pierce Brosnan, Colin Firth and Stellan Skarsgard. In this version we go back in time to see their younger versions. Flashbacks show us young Donna, now played by Lily James, who has graduated Oxford University along with her two besties, Tanya and Rosie, played older by Christine Baranski and Julie Walters who are just fantastic (as they always are in anything they do) The younger versions are Alexa Davies and Jessica Keenan. New visitors are invited to come to Donna’s renovated hotel on the island. Sophie invites her three fathers and moms friends but a storm hampers plans because people can’t get there. In this one - the songs don’t quit, there are plenty of one-liners, the dance moves are non-stop and the casting that was perfectly executed. This one may not be as great as the first, as it doesnt seem to have that glow. Likely because this one was shot in Croatia and not Greece but the performances are strong with James leading the way with her happy demeanor (and she's a solid singer.) This one doesn’t have the feeling of the first overall but the great flashbacks take us back in time to help it along and surprisingly the older casting and the younger casting - work very well in tandem. Overall, it’s light and breezy, airy and silly. Not the first but fun. ‘Mamma Mia! Here We Go Again’ is great if you're an ABBA fan and even if you are not. Remember when you walk in - you're going to see Mamma Mia. Not Othello.